Today we are one day before Christmas.. Have you got the perfect gift for everybody? Did you think about a gift for yourself, more specifically for your health? As we approach the new year, not only Christmas gifts come to my mind, but all those new year resolutions of taking care of ourselves and working out more. “The diet starts tomorrow…” as I always reflect after eating for 3 days straight at numerous family events through the festivities. How about actually doing something about it this year? I would like to show you a conference that is very close to my heart and I believe everybody can relate. Klewel via an AV partner in the USA went to Indianapolis to capture the 60th ACSM Annual Meeting. The American College of Sports Medicine is the largest sports medicine and exercise science organization in the world. More than 50,000 international, national, and regional members and certified professionals are dedicated to advancing and integrating scientific research to provide educational and practical applications of exercise science and sports medicine. The 60th ACSM Annual Meeting brought more than 6,000 physicians, scientists, educators, students and others to the Indiana Convention Center in Indianapolis from May 28 to June 1 of 2013. 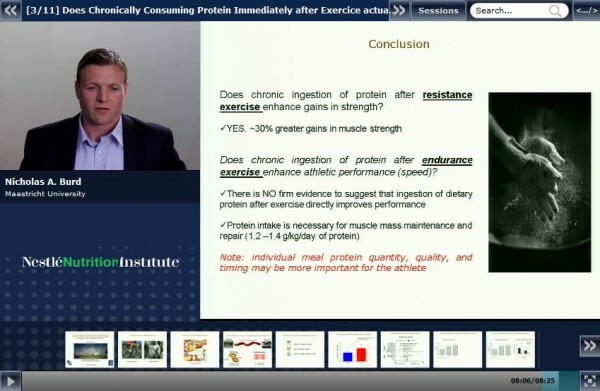 The cases included for example the debate of protein intake after exercise. Does it help you get stronger or faster? In the third talk, you will find Nicholas A. Burd from Maastricht University presenting a very interesting take on it, because we all see these big jars of protein sold at almost all of the fitness centers and it is important to know about the impact, before we start consuming it, because we think that we will look like the man or women on those jars. In the same way we can learn about the effects of bicarbonate, beetroot consumption before exercise, and the effects of antioxidants on our performance can be measured and have interesting results. This event is part of the symposium series that Nestlé Nutrition Institute makes available for us. All we have to do is register on their website and this, along with many other events are available for us to watch for free. Click on the video to register. Nestlé Nutrition Institute have recognized the importance of sharing science-based information to educate people. This is where Klewel solutions provide an extremely useful tool for them. By recording and archiving their conferences, workshops and symposiums they are able to educate us on these rather interesting topics. Our Triskel station archives the contents in a way that is easy to retrieve, watch and search later. 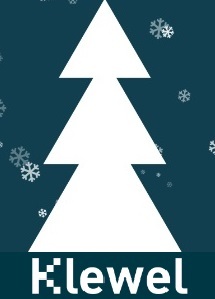 Klewel wishes you and your family a wonderful holiday season. We are looking forward to provide you with the best value added service for your events! Merry Christmas everyone!